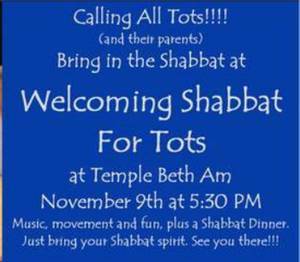 Come fill the sanctuary with our tots for “Welcoming Shabbat.” Filled with movement, music, and ruach (spirit), Rabbi Robbie and Rebbetzin Ellen help bring in the Shabbat with that special "Shabbat Spirit” followed by a Shabbat dinner. The only cost of the dinner is a Shabbat Shalom smile. All are welcome.